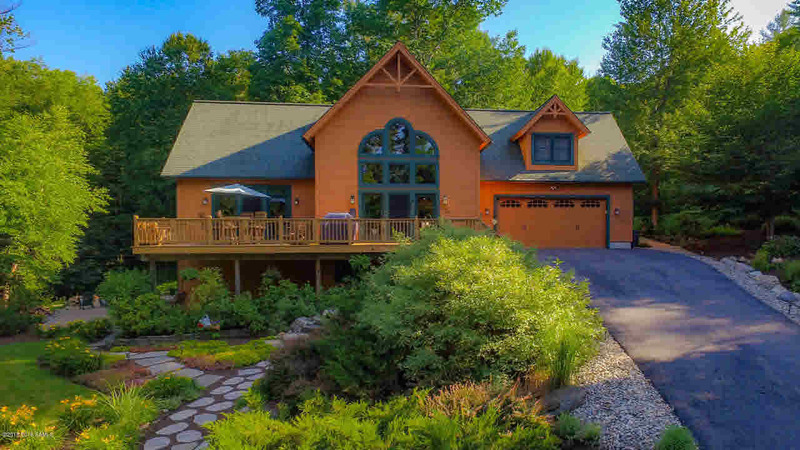 Custom designed & built ADK style home loaded w/ upgrades & extreme privacy. Conveniently located 2 mi from the shores of Lake George & I-87. Open concept main floor includes cathedral ceiling LR w/ 2 story stone FP, powder rm, cust kit/din w/ high-end appliances, wet bar, 3 season sunroom & oversized Master Suite w/ french doors out to spacious decking. 2nd floor incl 2 guest BRs, full BA & family rm overlooking main floor. The bottom floor is finished & has an above-gd family room w/ french door out to patio & firepit area. There are 2 more bonus rooms & a half BA adding to ample space for guests. Close proximity to Diamond Pt beach, 2-car att gar, whole house stereo system, beautifully landscaped. Insulation & solar panels keep energy costs LOW. Smartly designed energy efficient home!